15-Apr-2018 -- Imagine a gathering of over 8,500 geographers in New Orleans and not one of them visiting a confluence point. We were gathered for the annual meeting of the American Association of Geographers for several days. Determined not to let that happen, I, Joseph Kerski, set out into the field, as I have done after just about every AAG meeting for the past 15 years. I left New Orleans at dawn. It took me longer to reach this confluence after my trek to 32 North 91 West earlier on this day, owing to the fact that there were very few bridges across this part of the lower Mississippi River. Thus I was required to go north to I-20 at Vicksburg, west from Mississippi to Louisiana, west to Rayville, and then wind back along country roads to the area of the confluence point. But the countryside was one I had not yet visited--mid-state Louisiana, and after I left Mississippi on I-20, I drove into it from the east, and then when I exited the interstate at Delhi, it became even more interesting, with its two-lane roads. The town of Columbia was fascinating with its bluff and architecture and Ouachita River winding through the landscape. At Copenhagen, I left pavement and was now on dirt roads surrounded by dense forests. I got out of the vehicle at the same cemetery that other visitors mentioned. It was a lonely and quiet place. I gathered supplies and hat. I wished I would have brought some gloves, though, owing to the dense shrubs. Due to the tree cover, I could not get an accurate GPS reading, or even a good direction to the point. It was one of the few confluence treks where I actually became a bit disoriented. I started down the path on the left side of the cemetery, and then, following the supposed direction to the point, ended up making a complete circle of the cemetery, even returning to and passing the vehicle at one point. 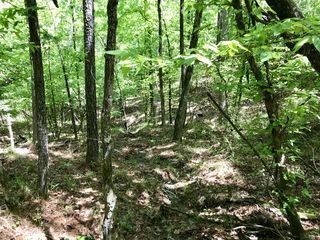 Then I crossed the path that I had started down, and took off into the trees and shrubs. At last I had a good direction and aim to the confluence point. A good many of the shrubs were full of thorns, and I stepped gingerly to avoid them and also the fire ant mounds. I descended the slope and the forest became denser. It took me quite awhile to get a fix on the point, and just when I abandoned hope of zeroing out the unit, I was successful. I must have wandered back and forth across a gully at least 20 times. It felt good to make the first visit here since 2001--17 years ago. It was a peaceful spot. I could not determine if the area had ever been logged, but perhaps not, owing to its fairly steep slope. The temperature stood at about 75 F on a mid-spring afternoon under sunny skies. I had visited latitude 32 north on a number of occasions in the past 20 years, from Texas on the west to Georgia on the east. I had also visited 92 west a few times, in Iowa and Wisconsin, far to the north of here. This was my first time on 32 North 92 West; I was amassing a tidy sum of Louisiana confluence points, though not as many as in other states. After taking video and photographs, I climbed the slope and made better progress reaching my vehicle than on the way in; here, I definitely used my track to guide me on the GPS unit. I reached the vehicle in only 15 minutes time. However, it was surprisingly easy to lose one's way in these trees. I reached the vehicle and left the area with one more goal: 31 North 91 West. Would I make it? #1: Site of 32 North 92 West, in the foreground, looking north-northeast. #2: Joseph Kerski at the confluence point with Not All Who Wander are Lost bag. #3: GPS receiver at the confluence point. #5: Sky view at 32 North 92 West. #6: View to the north from the confluence. #7: View to the east from the confluence. #8: View to the south from the confluence. #9: View to the west from the confluence.